If you or your loved one is a Medicare participant, this information will be very helpful for them in the upcoming months. We hope this information helps you transition smoothly with this Medicare change. Q: Why is Medicare issuing new Medicare cards to its beneficiaries? A: Medicare is taking this step to protect its beneficiaries from fraudulent use of Social Security Numbers which can lead to identity theft and illegal use of Medicare benefits. Q: What is the difference between the old and new Medicare cards? A: Old Cards contain the Medicare beneficiary’s Social Security Number, gender and a signature line. The new Medicare cards will NOT have a SSN, gender or signature line. However, the main difference is the ID number or Medicare Beneficiary Identifier (MBI). It is an eleven (11) digit non-intelligent, randomly selected, computer generated number made up of a combination of alpha numeric characters which have no significance other than to whom it belongs. Q: When will I be receiving my new Medicare card? 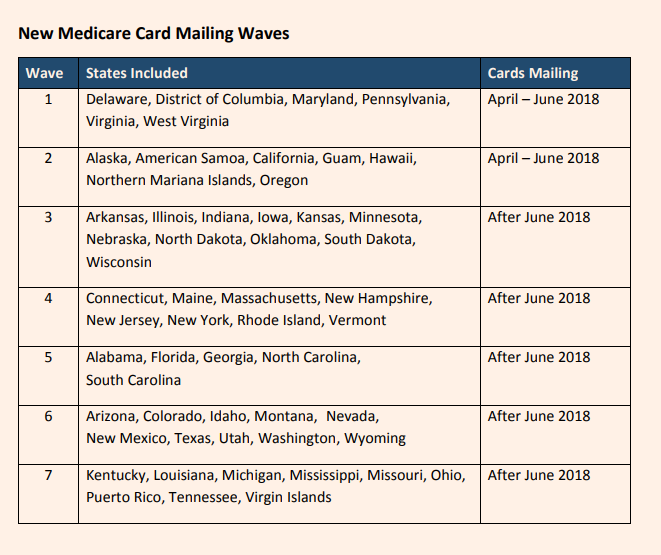 A: Medicare will be issuing new Medicare cards starting on April 1, 2018, by geographic region in seven stages. 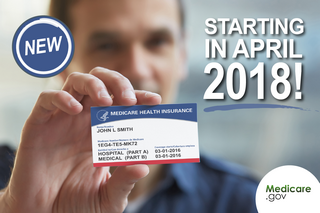 All Medicare beneficiaries should have their new card by April 16, 2019. See the diagram below to find the assigned time for your location. Q: What can I do to make sure that I receive my card during the assigned geographic mailing wave for my location? A: Contact the Social Security Administration (SSA) and confirm that the address on file is correct. If it is not, be sure to update this information with the SSA immediately to avoid delays in receiving your card. Q: Does the new Medicare Card mean that my benefits have changed? A: No. 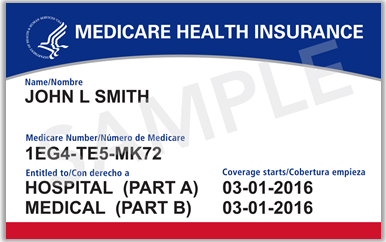 The appearance of the Medicare Card has changed, but your benefits will remain the same. Q: If I have a spouse or dependent that has been afforded benefits by Medicare, will they have the same MBI (ID Number) that I do? A: No. Spouses or dependents who may have had similar ID numbers in the past will each get their own MBI (ID Number). Q: When can I start using my new Medicare Card? A: Medicare beneficiaries that have received their cards can use them upon receipt. If you have not received your new Medicare card and are receiving medical care, please be sure to continue using your old Medicare card until the new Medicare card has arrived. Q: Do I need to protect my Medicare Beneficiary Identifier (MBI or ID #)? A: Yes! The MBI is confidential just like your Social Security Number and your old Medicare ID number (HICN). It is personally identifiable information that should only be used for Medicare. Beware of anyone who contacts you about your new Medicare card. Medicare will never ask you to give them personal or private information to get your new Medicare Number and card. If you need or want more information about this transition, please visit: https://www.cms.gov/Medicare/New-Medicare-Card/ or call 1-800-MEDICARE (1-800-633-4227).